My husband is a master of Derech Eretz, so I know he would encourage me to start this post with what I most appreciated about the last few days. I'm taking his unspoken advice and starting there. Monday afternoon, we met my former brother-in-law for lunch in Jerusalem. He was visiting Israel with his second wife and their friends as part of a cruise that included stops in Haifa and Ashdod. We first met when I was the age my 16 year-old daughter is now. Though our paths in life diverged considerably, his sons are my cherished nephews and it was an extraordinary gift to share a meal and to be able to walk with him, even for just a few minutes, through the streets of Jerusalem. It's been said that, when you live in Israel, eventually, everyone you know comes to visit. In the few months we've been here, we've had a handful of visits from people we know from The Old Country and I already see how that saying is not far from the truth. Monday night, we ate in the sukkah of old and dear friends. They had a few other families over and one guest described the experience of living in Israel so well, it bears repeating. The joy of being a Jew living in Israel is not a non-stop feeling of ecstasy, for who can sustain that? The joy of living in Israel is having a sense of shleimut, of wholeness, of contentedness, knowing that you are where you belong. That sounded exactly right to me. After dinner, a few of us went to the Beit Shemesh Festival, a free concert with lawn seating and a huge proportion of Jewish teens who all seem to know one another from camp, school and youth group activities. Even though the music was not familiar to me, the mood was joyful, my host was full of simcha and I felt happy to be celebrating among a thousand or more other Jews during our national, week-long holiday. Tuesday morning, we were privileged to return to Ben Gurion Airport to welcome more family Home. Their aliyah is a miracle to me. Although we are related through a marriage that did not last, we remained close over the years. We lived a block apart in Baltimore and, for the past decade, we spent countless Shabbat meals discussing the merits of life in Israel over life in the US. I'll be honest. I didn't believe they would really come. And yet, it was both surreal and thrilling to greet them at the airport and to follow them back to their new home. I've watched dozens of families plan for aliyah and I have never seen a family do it like this. They pulled the whole thing off - from making the aliyah decision to landing in Israel - in two months. They were gifted with so much help from Above that one cannot but conclude that they most definitely got a personal invitation from Hashem to live here. And now, we have the indescribable pleasure of having six more people who we love living here. Tuesday afternoon, we ate our last meal in our sukkah and I was surprised by the tears that sprang up in my eyes upon reciting the brief prayer for taking one's leave from the sukkah: "May it be Your will, Hashem, our G-d and the G-d of our ancestors, that just as I have fulfilled the mitzvah and dwelled in this Sukkah, so may I merit in the coming year to dwell in the Sukkah of the skin of the Leviathan. Next year in Jerusalem." I have never before felt so indescribably emotional at the end of Sukkot. WARNING: This rest of this post contains sadness. And then came Simchas Torah. In Israel, Simchas Torah and Shemini Atzeret are the same day. For as many years as I have been observant, I have had a painful relationship with Simchas Torah. It all started 21 years ago when, during my first year living as a Torah-observant Jew, I experienced the shock of my first Simchas Torah. As I did before every new Jewish experience that first year, I read all about the observance of Simchas Torah in advance. The books I read proclaimed joyously that, "On Simchas Torah, everyone gets an aliyah! Everyone gets to dance with the Sefer Torah on Simchas Torah!" So, in my innocence, I assumed that meant everyone gets to dance with the Sefer Torah on Simchas Torah. I went to the synagogue in happy anticipation. When the evening service was done and the mechitza was rolled away to make a large space for dancing, my excitement increased. And then I noticed that all the women pulled out folding chairs, poured themselves cups of Diet Coke and began to chat among themselves while the men danced with the simcha of the Torah. My disappointment was enormous. My sadness was deep. My resentment was huge. Over the next few years, I tried to cope in creative ways. One year, I organized a women's circle in my home during the hakafot. A few dozen women came to share Torah thoughts with one another. The next week, the rabbi of that community spoke about how men dancing with the Sifrei Torah are bringing down kedusha from the Heavens and that the women must be there to receive it or else their dancing is in vain. After that, the women were unwilling to leave the shul during hakafot. One year, I tried to organize women's hakafot in a completely separate, private location. I called a dozen or more Orthodox rabbis in Baltimore to borrow a Sefer Torah, but not a single rabbi would lend us one. And not a single rabbi could give me a reason that was any more compelling than, "It's not done." And, to add to my pain, many of the people I spoke to in those years, rabbis included, made me feel that there was something wrong with me for being unsatisfied with the status quo, for desiring something different. So I started coping with Simchas Torah by pretending it wasn't happening. I successfully avoided attending shul on Simchas Torah for the next several decades by entering a kind of self-imposed Simchas Torah coma. In the week leading up to Simchas Torah in Israel, I started re-experiencing all the old, traumatic feelings of resentment. "Why do Orthodox men act like they own the Sefer Torah?" I decried to anyone who would listen. Even in places where women might have a chance to dance with a Sefer Torah, one often hears that, "In such and such a place, the rabbi gives women a Sefer Torah." Again, proprietary, for men can only give women a Sefer Torah if they regard it as theirs to give. Thus, with a heart full of ambivalence, I went to shul last night. This was my first Simchas Torah in shul in many, many years. I'd like to say that the whole experience, my first Simchas Torah in the Holy Land, was completely healing. Despite the fact that Rabbi Shlomo Carlebach, the spiritual inspiration for the Happy Minyan at which we daven here in Israel, permitted women to dance with a Sefer Torah on Simchas Torah, this is not what happened last night. As expected, the men joyously sang and danced around the bima with children on their shoulders and Sifrei Torah in their arms while the women did one of three things: chatted, danced briefly and without much gusto or peered into the men's section to watch. Over the hour or so I was able to stay in shul without crying, I did all three, but I felt precious little simcha. At one point, at the request of an elderly woman from the congregation, the mechitza was opened so the women could actually see the Sifrei Torah. Apparently, the mechitza opening coincided with a brief spurt of dancing on the women's side and I overheard one young man tell his mother that he was offended to have glanced over and seen women dancing. So apparently, it is not enough that women are denied the opportunity to hold and dance with the Sefer Torah. We must also be denied the opportunity to squeeze out some minuscule portion of our own simcha as we watch men cradling the Sifrei Torah we all love but do not have equal access to. If given the opportunity, I would like to ask this young man just how much simcha he would feel if he was in my shoes. One friend told me she likes hakafot less and less each year. She doesn't want to feel resentful, so she asks Hashem to remove her feelings of resentfulness. It's far from ideal, but it's an emotional/spiritual place I can aspire to be and I'm glad she shared those words with me. I skipped shul this morning and prayed at home. In the afternoon, I attended a Simchas Torah luncheon with 150 members of our congregation, during which I listened to some heartfelt words of Torah about a holiday I absolutely could not relate to. The holiday he described does not exist anywhere in the realm of my experience. I spent most of the rest of the day at home learning midrashim related to the first parsha of the Torah, in which Gd creates all life. I'm convinced that there is something fundamentally flawed in the way we observe this chag. How can a chag that is supposed to be the epitome of simcha (joy) be so atzuv (sad) for so many? My older daughter who is a thousand times more committed to formal tefillah than I am, explained simply that, "Simchas Torah is a man's holiday." She spent the day avoiding it almost as completely as I did, but she did so seemingly without pain. In the future, I should probably lower my expectations for the day to, I don't know, let's say, zero. I must tell myself that all the flowery talk about the day and its spiritual potential simply don't apply to me. There are so very many things I love about being a Jew in Israel. Regrettably, Simchas Torah cannot be counted among them. It's just before Sukkot begins in Israel. There's an energy, a happiness, that I'm feeling that is unique to this place. Sukkot is visually overwhelming in Israel. Whether you live here or are visiting for the chag, it's utterly impossible to fail to notice that Sukkot is coming. On the way to ulpan yesterday morning, I started taking pictures to document what it looks like here. In the 10 minutes between getting off one bus and getting on another, I was already overwhelmed with images. For those already here, these images will be familiar. For those of you not yet here, consider this a preview. 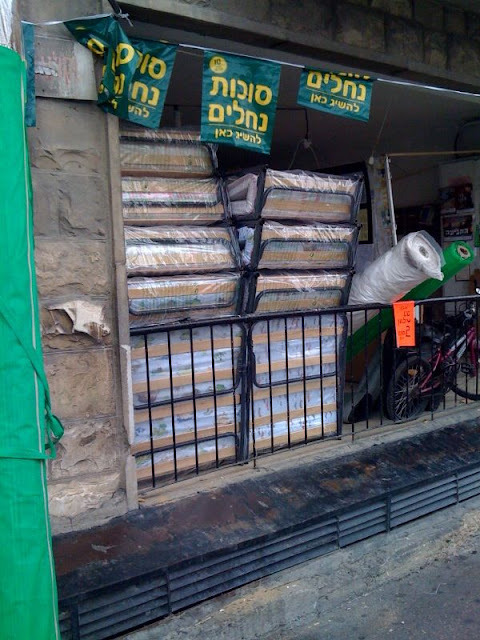 All over the streets of Jerusalem are stores and stands of all kinds selling all things Sukkot. This was a couple with a modest stand of decorations setting up early in the morning on King George. I took this from across the street, so it may be hard to identify, but there is a huge pile of palm leaves for schach for sale (look between the cars). Meah Shearim is a center of pre-Sukkot sales activity. Geula is a very close competitor. Seriously, the signs are everywhere. Hauling schach home the old-fashioned way. Hauling schach home the modern way. WOW! The largest etrog I've ever seen!! A shop selling cots for those who want to sleep in the sukkah. Carefully selecting each of the arb'ah (4) minim separately. Iconic shot of religious men examining the minim. Posters at the bus stop advertising a trip to Hevron and Kever Rachel for Chol HaMo'ed, (the intermediate days of the festival). How can you not love a country whose buses wish you a joyous holiday (Moadim L'Simcha) in the language of your people? Even the department store window wishes Am Yisrael a Chag Sameach. 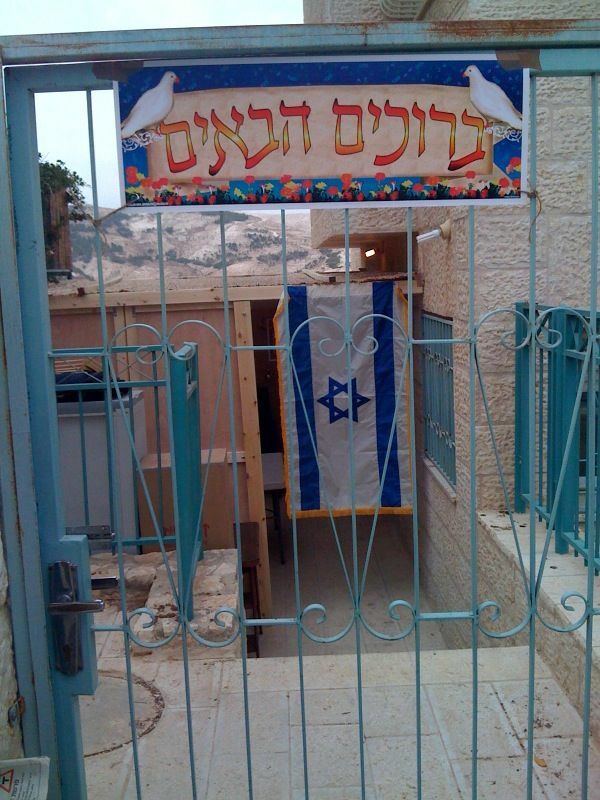 Closer to Home, this is the welcoming entrance to our very first sukkah in Israel. This is Gilad, our sukkah engineer. The winds here are very strong, so the sukkah Gilad built for us will stand up to gale force winds. Don't you just love a guy who cleans up after himself? Our fabulous sukkah decorating team. We paid extra to hire the apple queen this year. Hard at the kind of creative work at which she excels. You can't really feel it without being here, but this is a sense of the sukkah, just before the people, the food and the holiness of the holiday descend. What Daniel Gordis says is true. 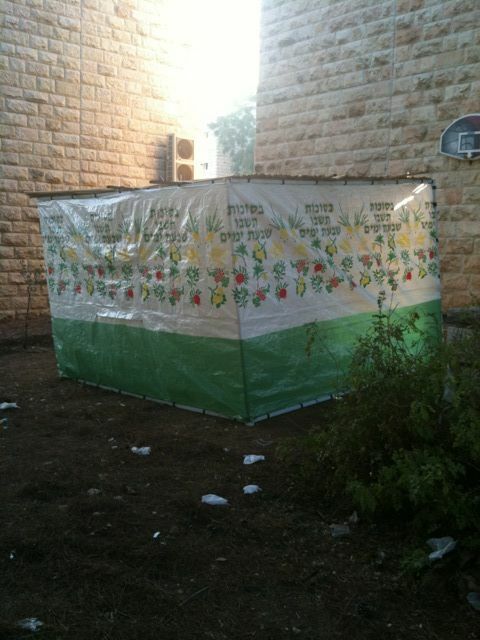 In other places, Jews observe Sukkot. In Israel, it is Sukkot. Part of the joy of living in Israel is the diminished emphasis on material acquisitions in favor of spiritual pursuits. Like almost all our neighbors who have a car at all, we drive a modest car that's way more than five years old, and we are very grateful to have it. Israel is a place where "it's good enough" is a useful motto for guiding one's material life. The plastic bags, cups and plates here are far flimsier than what we used in America, but I have come to see them as good enough. In fact, throwing away plastic ware after one use seems far less wasteful to me here than it used to. We, and most of our friends, live in much smaller spaces with far fewer amenities than we had in America, but it's certainly good enough. Offices, institutions and synagogue facilities are often much simpler here than in America, but they are functional and good enough. In fact, fancy cars, excessive material possessions and ornately decorated homes can be seen as distasteful in the context of life in Israel. All of this parallels an emphasis on spiritual development. It's as if the material world, more modest, but by no means deficient, contracts itself to make room for spiritual pursuits. In my own experience, this translates to more time spent praying, more time learning Torah, more time seeing, talking about and talking with Gd in every day life, more Torah classes and more potent (if sometimes far too fleeting) spiritual insights. This video from Aish.com is genius. The speaker is captivating and the message is a powerful one. Whether we live in Israel or not, we all want a relationship with Gd. We want more meaning in our lives. We want to stop chasing ephemeral goals and focus on acquiring something of significance, not just, for example, another pair of designer shoes. And that's what Yom Kippur gives us a chance to find. Gmar Chatima Tova - may we all be inscribed and sealed for a life of meaning and purpose. A few days ago, I was walking toward my second bus stop of the morning and caught sight of the first sukkah I've ever seen in Israel. I felt so happy, I had to stop and take a picture. Then this morning, walking to my 6:45 AM bus, I saw two boys on swings near my home and was startled by the view. 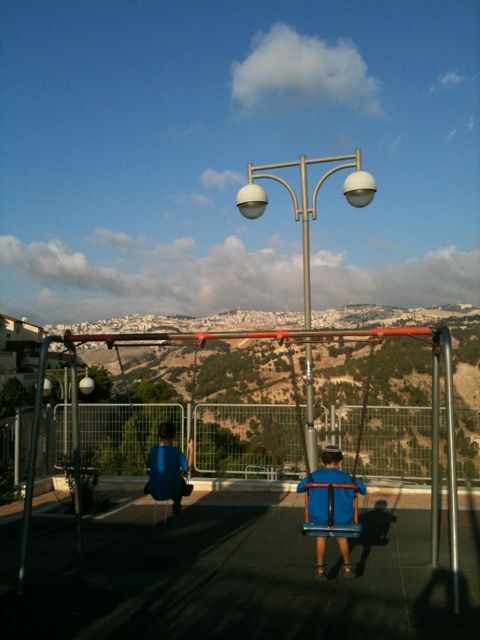 When kids swing for a few minutes before school in a playground in Israel, it's possible to see Jerusalem in the distance. And it occurred to me that there are dozens of other small pleasures of daily life and ways in which my life is so much richer here. Knowing I've corrected a 2000 year-old punishment by coming to live here. Having a stranger on the street smile and ask how I'm doing in Hebrew and being able to answer her in Hebrew. Feeling happy almost all the time. Seeing neighbors walking home from shul while I wait for my 6:45 AM bus. Making progress in ulpan, as evidenced by a willingness to talk to the cell phone representative in Hebrew. Giggles from our young adult daughters who share a common history, language, and a, ahem... cozy living space. Seeing Har Habayit (The Temple Mount) from the bus every morning. Beginning to think in shekalim. Riding buses and feeling like a part of Israeli society. Seeing familiar faces on the bus. Knowing bus routes and times. Having people around who automatically understand me because we are on the same path. Witnessing kibbutz galuyot (the in-gathering of the exiles) every day by having classmates from 11 different countries (Azerbaijan, Chile, England, France, Ireland, Italy, Russia, South Africa, Switzerland, the US and Tashkent) in my ulpan class. Coaching and encouraging other families who are still a few steps earlier on the path Home. Seeing my younger daughter taking chances and becoming a fiercely independent traveler unbelievably quickly. Reading newspaper articles about Israel with the perspective of a resident, no longer an outsider. Having the earliest bedtime in the house and, not a small thing for a night owl like me, getting up earlier than everyone else. Quickly adjusting to a week that begins on Sunday. Learning which Israeli brands we prefer and being less and less overwhelmed at the grocery store. Walking the streets of Jerusalem listening to the Jerusalem songs play list on my iPod. Davening on the bus in the morning. Being amazed by bilingual kids who switch back and forth effortlessly. Going to the airport again and again to greet more family and friends who are coming Home. Being the home base for family and friends passing through Israel. And realizing, as I go off to ulpan, our 10th grader goes off to school, our older daughter goes to her Sherut Leumi (national service) placement and my husband prepares for a class he'll soon be teaching, that we are actually LIVING here. Life is just richer here. And if I would but take a moment to let it in, I can feel it almost every moment of the day. I thank Gd every day that we got here in time. This was our first week as Israelis. Well, not in the most literal sense, since Jewish immigrants to Israel become citizens from their very first moments in the country. But this week, 8 weeks since we arrived on aliyah, we really lived like Israelis. My husband earned his first shekel paycheck this week. Our older daughter started her year-long Sherut Leumi (National Service) position. Our younger daughter started 10th grade at a new school for English-speaking teens. And I started ulpan at Beit Ha'am (which literally means, "the people's house" or, due to the art form that is translation, "house of the people") in Jerusalem. A word about ulpan. It's a 5-month commitment of intensive Hebrew study for new immigrants. Five hours a day, five days a week. Ulpan is a national institution in Israel, not quite as ubiquitous as the army, but every bit as much a part of most immigrant's experience as the army is for typical Israeli families. There are 12 people in my ulpan class. There are three Americans including me and a married couple, a woman from Ireland, a woman from England, a man from South Africa, a woman from Russia, a woman from Italy, two women and one man from France, a woman from Switzerland and our Israeli teacher. That's kibbutz galyuot - the ingathering of the exiles, right there in my classroom. Getting to ulpan means leaving the house in time to catch a 6:45 AM bus into Jerusalem, followed by a second bus which takes me to within a 5-minute walk of my classroom building. In all, it's an hour and 15 minute commute. But, at least at this early stage, despite the insanely early hour, it's a commute that makes me feel like I am part of the country in a way that nothing else has. The 6:45 AM bus is packed with Jews. Men and women on their way to work. Kids on their way to school. College students on their way to Hebrew University. New immigrants like me on their way to ulpan. Women praying or reciting chapters of Tehillim (the Book of Psalms). Teens flirting with one another. Old people on their way to shop or visit with friends. It's a massive, beating heart of Jews from all over the world and it delights me so much to be a part of it. There is genuine pleasure in knowing exactly which bus to take, when it will arrive, at which stop to get off and how long it will take to walk to my destination. In the first weeks here, when nearly everything was new, there was a low hum of anxiety each time we had to locate a new place to transact business. But now, with the week just passed, we have begun our routine and, in that, there is joy. Last night, as we promised one another before we left America but hadn't really done regularly, we spent Thursday night at the Machane Yehuda shuk, buying provisions for Shabbat. Thursday night in Israel after a week of routine has a very different feel than our Thursday nights here to date. With a shock of recognition, I realized that Thursday nights in Israel, the beginning of the weekend, are like Friday nights used to be before I started keeping Shabbat. We have no school and no work on Friday. The day is about preparing for Shabbat. This morning, we were all able to sleep in a little later. No Saturday morning cartoons, but a day of relative leisure. And, a short time from now, our well-earned Shabbat descends. Lots of great meals and our first sleep-over Shabbat guests, one of my nephews from Baltimore and his yeshiva friend from Manchester, England. I don't know by what merit we have been granted such a relatively smooth and comfortable transition, but I am grateful to Hashem every day for the privilege of living in His Holy Land and for the joy that accompanies the feeling of settling in.